Filled with a variety of appetizers tartlets are the perfect decoration festive and everyday table. These can be baked at home, but you can buy in the store. 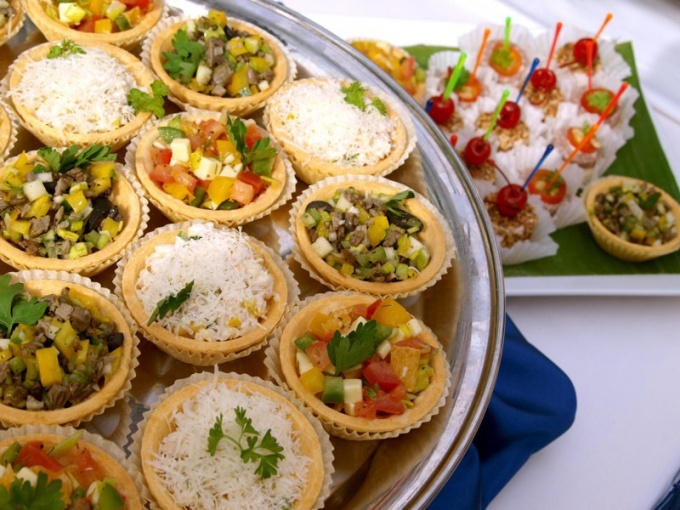 To fill the tartlets are suitable a variety of snacks and salads made from meat, fish, seafood, vegetables and fruits. Cut fillets salted herring cubes. The eggs hard boil. Apple and onion peel. Prepared ingredients cut into cubes. Walnut kernels mince. Combine all ingredients, stir and season with mayonnaise. Then place the prepared snacks in tartlets and garnish with finely chopped greens. Chicken liver cut into cubes and fry in vegetable oil. Tomatoes and peppers wash, dry and cut into small slices, cabbage finely chop, egg chop with a knife. Then connect all prepared ingredients, add roasted without oil sesame seeds and whole black olives. Mix everything well, season with salt, pepper and season with mayonnaise. Again mix well, spread cooked meal "Luxury" in tartlets and serve. Avocado peel, tomatoes and sweet Bulgarian pepper wash. Then slice the prepared vegetables in large cubes. Add the shrimp and olives. Refill the snack a small amount of olive oil, salt and pepper. Mix well and place in tarts. Pumpkin, carrot and apples wash, peel and chop the flesh on a coarse grater or blender. Then all the prepared ingredients mix, salt, season with sour cream or mayonnaise, put in tartlets and garnish with chopped dill.